The last general election in 2010 ushered in only the second hung parliament since World War II and a subsequent coalition government was formed between the first party, the Conservatives, and the third party, the Liberal Democrats. The upcoming election, taking place on 7th May, looks set to produce a similar result with no single party predicted to win an overall majority. The two main parties, Labour on the centre-left and the Conservatives on the centre-right, have been neck and neck throughout the election campaign with recent polls suggesting Labour might gain three or four seats over the Conservatives to win it by a nose (in true First Past the Post style). In addition to the unpredictability of the result, this election is made all the more interesting by the promise of an “in-out” referendum on Britain’s membership of the European Union, should the Conservatives win on 7th May. The party has included a pledge in its manifesto that a referendum on the EU question will be held by 2017, should it constitute the government after the general election. Whilst a potential referendum on European independence might impact the forthcoming election result, the effects of another independence referendum will almost certainly be felt. In September 2014, Scottish voters turned up at the ballot box in record numbers to return a 55% majority against the proposal to make Scotland a country independent from the United Kingdom. The turnout of 84.6% was the highest recorded for a referendum or election since universal suffrage was introduced. Although single issues often galvanise voters, the effect of the independence referendum will be felt at the general election. The nationalist separatist Scottish National Party is predicted to take third place with a possible 52 seats, despite only fielding candidates north of the border, a situation that is without historical precedent. It is not only the Scottish National Party that is convinced that the upcoming election heralds the end of the traditional two-party politics of Westminster. The Greens, for example, have seen a rise in support and the party is contesting 571 of a possible 650 seats (in 2010, the party fielded candidates in only 335 constituencies) and, on the right, Britain’s largest populist party, the UK Independence Party (UKIP), looks set to cause upset. UKIP won the biggest share of the vote (27.5%) in the 2014 European Parliament elections, and it has been continuing to exploit its electoral appeal in the run up to the general election. Although support is down five points since UKIP returned its first two MPs to the House of Commons as a result of by-elections in 2014 (both MPs defected from the Conservative party to UKIP), it stands at around 12% and UKIP is expected to do much better than the Liberal Democrats, the current coalition partner and long-standing third party in British politics (although, due to the First Past the Post electoral system, the share of votes is often not reflected in the share of seats). Even if support slips further over the next week, UKIP is in a much more robust position than it was at the last general election in 2010 when the party achieved only 3.1% of the vote and no seats. UKIP has been primarily a threat to the Conservative party, although has also succeeded in taking some support from the Labour party, and the party is standing in 624 of the 650 Westminster constituencies. Included in these constituencies are all three Leicester city districts (Leicester East, Leicester West and Leicester South). Leicester is fairly solid Labour ground with one constituency (Leicester West) having had Labour MPs consistently since 1974 and another (Leicester East) having one of the highest majorities for a MP in the country. Leicester is one of the most ethnically diverse cities in the UK with 49.4% of the population identifying as belonging to an ethnic minority in the 2011 census. 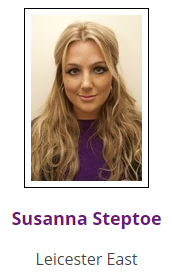 It is into this environment that Susanna Steptoe has stepped. As UKIP’s parliamentary candidate for Leicester East, Ms Steptoe is one of the party’s newest recruits, announcing her candidacy officially on 24th March. In the second of POP’s interviews about the nature and development of populism, Laura MacKenzie asked her a few questions about her personal position, as well as the populism and policies of her party. LM: Tell me about Susanna Steptoe: former sports journalist, marketing director, and football agent; current English teacher. What led you into the world of politics and, more specifically, into the world of UKIP? SS: Funnily enough, during my A Levels, I had some fairly Left-leaning subject teachers whose views I found I was massively opposed to. There was a general election the year I turned 18, and as a result of debates we had with said teachers, my friend and I did our research and aligned ourselves with the Conservatives. I actually helped our local parliamentary candidate post a few leaflets and drummed up support for him in the sixth form. I was campaigning even then! Upon leaving University, I qualified as a teacher and once again found myself politically alienated in a school environment, as the majority of my colleagues were staunchly Left. I moved to Cape Town with my work, and really enjoyed the more Right-based leaning of the commercial world. Upon my return to the UK, I was dismayed by the direction the country was (and is) going in, and decided to nail my colours to the mast and support UKIP. I believe they are the only party with the guts to stand up to the PC brigade and truthfully address the issues that are having a detrimental impact on society. Whilst I respect David Cameron and certainly do not hold him personally accountable for the mess this country is in, I do think we are desperate for change. LM: At Warwick University you were on the executive committee of the Warwick Conservatives group, yet now you are a UKIP general election candidate. Are you another example of a disaffected Tory seeking representation elsewhere? SS: By the time of the last general election, I was becoming increasingly undecided as to where I aligned myself politically. I think if the truth be known, I felt, and do indeed feel, that the Tories have played to the middle as it is safe and in doing so have actually alienated true Conservative voters. Many people label UKIP a protest party, and in a sense it is – I for one am protesting that a party I once identified with has watered itself down, and forfeited truth in the process. UKIP are offering common sense solutions to very genuine problems, and I am proud to represent them. LM: Leicester East is a multicultural, multiethnic constituency with an approximately two thirds non-white majority, 58% of whom identify as Asian. A third of the population categorise themselves as Hindu, although there are also significant Muslim and Seikh groups. 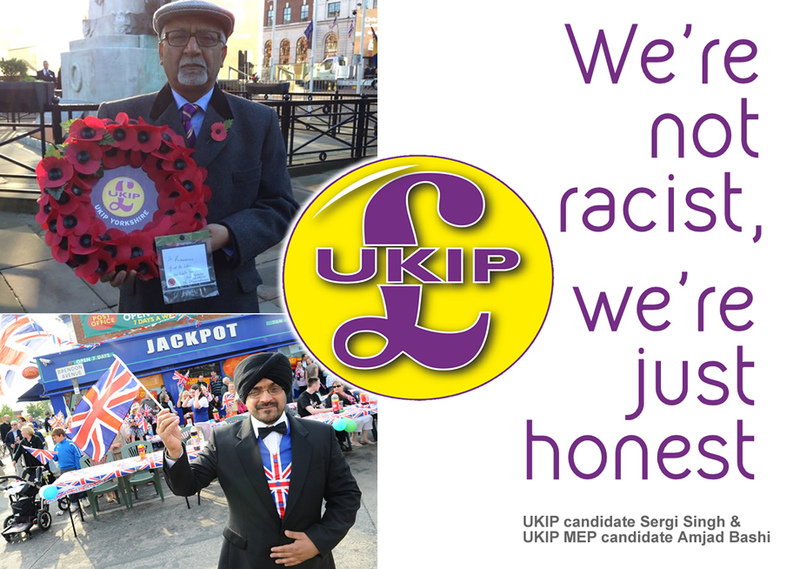 Do you not think it is somewhat inflammatory for UKIP – a party regularly battling allegations of racism and xenophobia – to field a candidate in a constituency like Leicester East, particularly a candidate who is white and identifies strongly as a “committed Christian”? SS: Ironically, the fact I am a Christian has broken down barriers in that my faith, not my political stance, shapes my core values and that is the same for a lot of people in my constituency, whatever their religion. I believe in honesty, integrity and morality, and most people I have met whilst out campaigning would share such beliefs. Rather than it be inflammatory, UKIP know I am motivated by wanting the best for every single person in the UK today (as I believe they are too). Nothing I say is designed to cause controversy, or indeed to be inflammatory. There are so many misconceptions surrounding UKIP, and every time I am given a platform to speak, I use it to reaffirm our and my position, and also champion the people. By ‘the people’, I mean every person living in the UK today. I have, however, been labelled ‘racist’ from a small minority, and have had involvement with the local police. I didn’t expect an easy ride, but it has been somewhat daunting to receive such a reaction from people who haven’t met me or given me a chance to explain my views. I am not a racist. I abhor racism. There is quite a hostile attitude to the entire election process in some factions of the local community, so I understand why this has come about, but I am also disappointed as it has marred an otherwise fantastic experience. LM: In your candidate profile, you mention that you feel “particularly strongly about the impact immigration is having on the educational development of young people in the state system”. I assume you perceive immigration to be having a negative effect on young people’s educational development (although your profile does not explicitly state this). As someone who is currently employed as a teacher at Moat Community College, a secondary school with an extremely high ethnic minority and immigrant population, whom do you feel is being negatively affected by immigration? The immigrant pupils themselves? Second generation ethnic minority pupils? SS: Everyone. I think it is awful that our government have a supposed ‘one size fits all’ National Curriculum, when nothing could be further from the truth – one size does not fit all. I have incredibly intelligent students who don’t speak much English, have recently arrived in the UK, and are expected to pass exams that are culturally and academically alien to them. I don’t believe any child’s entire future should rest upon such exams – it puts so many great kids in a hopeless situation. It is tough enough to get work, and it is of little surprise that Leicester has one of the highest unemployment rates in the under 24 category in the country. Further, as a teacher I was trained specifically to teach Secondary-level students. When youngsters are arriving with no English, it’s a case of starting at the very beginning. I was never trained to teach phonics, or all the basic language techniques, so I and others are totally out of our depth. Also, those who do have a command of English are obviously being held back by a system that is trying to differentiate far too wide a spectrum of needs and abilities. It all needs rethinking, so that everyone who is in the UK today is given the best possible education, and indeed, chance of a positive future. LM: Keith Vaz, the sitting Labour MP for Leicester East, has held the constituency for 28 years and currently has a 14,000 majority. UKIP polled only 1.5% (along with the Greens) in the constituency at the last election in 2010. Given that you are highly unlikely to come anywhere close, far less to beat Vaz to the top spot, what really is the point in you standing for election? What is the overall aim that is driving your campaign? SS: Truth. If life was about winning all the time, we would rarely bother stepping outside of our comfort zone. I want to speak out for those who don’t have a voice, including the students I teach. It is a privileged position, and one I take extremely seriously. I don’t look at it as pointless – I look at it as a small step in doing what I can to highlight issues that desperately need addressing. LM: Like all good populists, UKIP make continual references to “the people” as being the beneficiaries of their policies. In fact, the party has called its recent policy statement “Policies for the People” and, in launching the 2015 manifesto, Nigel Farage insinuated that UKIP represents “the will of the British people”. Can you clarify who constitutes “the people”? SS: ‘The people’ refers to every single human being who is living legally in Britain today. LM: The concept of “Britishness” is a recurring theme throughout the rhetoric and literature of UKIP, and the current slogan of the party’s manifesto is “Believe in Britain”. UKIP advocates patriotism and wishes to encourage Britons to take pride in their culture. You mention, in your own candidate profile, that you want to play your part in promoting the “restoration of British culture”. However, it remains rather unclear what this concept of “Britishness” really means. Nigel Farage has said that Britain need to stand up for its “Judeo-Christian values” – is this where Britishness lies and, if so, how does that affect those British citizens of other faiths and none? How can UKIP advocate freedom of speech and religious expression, whilst rejecting multiculturalism? all, and I would argue that those issues are not even linked. It is a worrying reflection of the times that ‘patriotism’ and taking pride in one’s culture are seen as so distasteful! We just marked the centenary of WW1, where young men died fighting for the freedom we have today. I frankly find it offensive when anyone questions our right as individuals to take pride in a country that such sacrifice was made for. Judeo-Christian values are, loosely, the teachings of the ‘Ten Commandments’, and most people, regardless of their own beliefs, would agree concepts such as ‘do not steal’, ‘do not commit adultery’, ‘honour your mother and father’, ‘love your neighbour’ are good, wholesome ways to live. They are also ways in which people from all different backgrounds can function positively as a wider community that is inclusive of all. Multiculturalism has brought with it a diversity we celebrate, particularly in cities like ours where we have a wonderful mix of people from all different creeds and cultures. I do, however, fully support the observations of Farage et al – we do have individuals and groups living in our cities whose cultural practices and beliefs are not conducive to wider community, and anyone who denies this is walking around with their eyes closed. Anyone who goes to live in a different part of the world should live within the laws of the land – as someone who has lived abroad I have indeed practiced what I preach and would expect the same from anyone living in Great Britain today. Recently in my constituency, posters have gone up urging followers of Islam to boycott the Election as it is ‘shirk’ to vote for man-made laws. Such posters are inflammatory and indeed intimidating for voters, and stand in opposition of our democratic right to vote. Further, man-made laws are essential to the function of society. No religious text that I am aware of states that it is a form of idolatry to vote for man-made laws, and on this issue alone I have spoken to Muslim friends who are angered by such groups trying to incite problems and cause divide. Most voters, regardless of their heritage, seem to genuinely desire peace and harmony. That’s where ‘Britishness’ comes in. There are plenty of definitions of Britishness that float around and actually cause general confusion, and I think that’s why we fear the term and it’s so often seen as negative. The government define ‘respect’ and ‘tolerance’ as fundamental British values, and that’s a good starting point, but the ‘tolerance’ part needs greater definition, otherwise it becomes another area the PC brigade call all the shots on, often to the detriment of others. When asked to define Britishness, I believe in the following: democracy, the rule of the law, individual liberty, tolerance of those with different faiths and beliefs, as long as they promote participation in wider community life. LM: UKIP has made much of the perceived unrepresentative nature of the current political establishment, who has let the British people down “time and time again”. On your own election leaflets, you talk about voting out career politicians and voting in people “with real world experience”. Is there not a problem, though, that, by contesting elections and seeking to create a manifesto for government, UKIP becomes part of the establishment that it seeks to stand against? We have seen in other European countries that electorally-successful populist parties who campaign on an anti-establishment mandate and find themselves as minor coalition partners invariably fail to adhere to their anti-establishment position (Austria’s Freedom Party is a case in point). Why would UKIP be any different in this regard? SS: It is a personal opinion and one not necessarily shared by others in our party but I believe common sense will prevail when we leave the EU. Our job is partially complete in laying down a new strong foundation to take Britain forward. Proportional representation will cement that foundation. Additionally, UKIP wants far reaching political reform to ensure that government answers properly to Parliament and that Parliament is accountable to the people. We would give voters real power to sack their MP, Councillor or other elected politician. Career politicians will have to deliver or face the consequences. LM: UKIP’s main bugbear has always been the European Union and Britain’s membership thereof: in many ways, leaving the EU is the raison d’être of the party. UKIP’s manifesto is full of assertions of the ways in which Britain will regain control over key issues, with farming and agriculture often being used as an example. However, many of the election promises given by UKIP as evidence that Britain will benefit from leaving the EU, particularly in areas of agriculture, already deal with issues over which the UK has control. One example (there are others) is UKIP’s promise to allow the British parliament to vote on GMO produce. However, the European Parliament has already backed legislation to allow EU member states to restrict, or to opt-out of, GMO cultivation in their own territories. Is it not misleading, therefore, for UKIP to imply that Britain does not have control over something that is, in fact, a member state responsibility, in order to create a sense of anti-EU sentiment among its electorate? SS: I agree with your opening statement, and answer by affirming that we originally entered the EU specifically for a trading relationship and our continued membership is having a hugely detrimental effect on self-government through European laws and legislation. Immigration is of paramount importance and it is essential that we get back control of our own borders. This cannot be done through continued membership, and in my opinion this is the single most important aspect of the long-term security, wellbeing, and continued economic development of the country. As a teacher in the inner city my greatest concern is to correct and prevent further problems caused by our immigration policy over the past 17 years. I am not an authority on agricultural policy; however, I do support our policy and believe that outside the EU, free of the Common Agricultural Policy (CAP) and excessive regulations, we will be able to introduce fairer, simpler ways to support farmers. LM: Much is made in the UKIP manifesto of the perceived destruction of Britain’s fishing industry, brought about by the EU’s Common Fisheries Policy, although the complex issue of defining which fish are “British” fish (fish stocks living in British waters are not confined to them, due to migration and life patterns, as well as the blurring of borders between British and other member states’ waters) is not addressed. There seems to be some misunderstanding with regard to the statistics on quotas found in the UKIP manifesto. There is an assertion that British fisherman are forced to throw “British” fish such as haddock overboard and, instead, import it from other EU countries due to unreasonable quotas under the Common Fisheries Policy. However, the UK has 84% of the North Sea’s haddock quota (Council Regulation (EU) 2015/104) so it seems extremely unlikely, does it not, that fishermen find themselves in this position as a rule? Perhaps this misunderstanding would have been avoided had UKIP MEP (and party leader), Nigel Farage, actually attended more than one of the 42 meetings held by the Fisheries Committee, of which he was a member for three years. Why should people trust UKIP in this general election when the party has done next to nothing to protect the interests of British fishermen in Europe, even though MEPs have had the opportunity to directly impact legislation, and have been elected to do so? LM: In the European Parliament, UKIP currently belongs to the group ‘Europe of Freedom and Direct Democracy’. As of 24th March, according to the data from Vote Watch Europe, the 5 Star Movement and UKIP, the two biggest parties in the group, voted identically just 148 times out of 541 (27.3 % of the total) while around 38% of the time they were on diametrically opposed sides. In the remaining 188 votes (34.8%) the disagreement was only partial: one of them voted for or against the measure in question and the other abstained. Why did UKIP decide to form a parliamentary group if there is no political agreement? SS: I am not a MEP and therefore unable to comment. I only joined the party recently. LM: In July 2014 at the European Parliament opening session (as has been the tradition for some years now) an orchestra came in and played Beethoven’s “Ode to Joy”, the unofficial EU anthem. 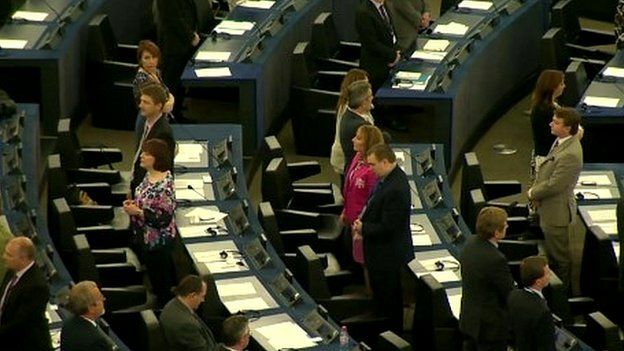 The UKIP MEPs stood up and turned their backs. The same day this message was published: “National democracy and EU membership are incompatible. We will do everything we can to free ourselves from this corrupt institution”. Don’t you think UKIP’s role inside the European Parliament is problematic since the party rejects its authority but not its funds (around 2.5 million Euros for the ‘Europe of Freedom and Direct Democracy’ group)? Don’t you also think that this situation calls into question the integrity of the party and of its leader, who sits as a MEP? SS: No, I do not think it calls into question the integrity of the party. I do think that it brings much wanted publicity to the fact that 77% of the population of this country is worried about immigration, and the two main parties have ignored their concerns until now. If it wasn’t for UKIP, this election would not be addressing the real issues that the electorate has. The only way we can address these issues is by bringing them to the attention of the electorate. Sadly the British Broadcasting Corporation (BBC), in particular, are heavily biased against UKIP and do not treat the party fairly. Unfortunately, as a result the only way we can get truth across is by ‘grabbing the headlines’. LM: What will Susanna Steptoe be doing on 8th May? SS: Hopefully having my first night of more than five hours sleep in several months! UKIP Leicester is a team, and we and our families have stood side by side in this election, often alienated by others for having taken this political stance. We will still be a team on 8th May, waiting for results from all the different counts, and supporting one another in whatever the outcome. This is only the beginning. How refreshing to come across an eloquent, articulate and educated member of UKIP. I thoroughly enjoyed reading the professional and well sculpted article. @Alex Clayton: True, it is interesting to notice that UKIP is not only composed by racist fanatics, but also by people with a reasonable point of view. On the other hand, this interview also confirms that UKIP is not entirely consistent when tackling issues such as multiculturalism. All in all, thanks Laura for this dense and detailed interview! Luca – perhaps part of this inconsistency in position comes from the rather incoherent and unformed UKIP party structure. UKIP does not have a developed party whip system and, at the local level, at any rate representatives are not compelled to vote with their party. There are no sanctions on members who diverge from the party line (such as it is), unless their comments actively bring the party into disrepute (however defined by the party’s executive committee). 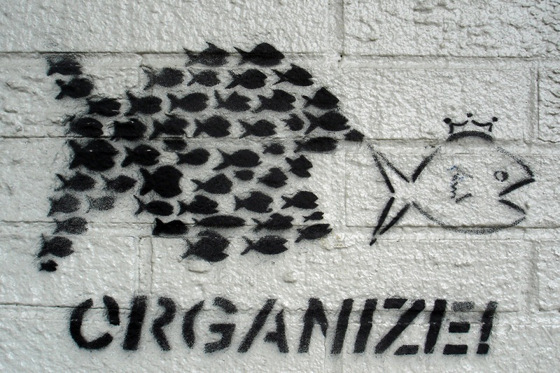 This creates a situation, therefore, where individual members can freely hold wildly differing positions and opinions. Ms Steptoe is very clear in presenting herself as a reasonable individual who abhors racism and welcomes cultural diversity, and who seeks what she considers fair, sensible and non-discriminatory measures for tackling perceived negative effects of immigration. Is she at odds with other members of her party? Undoubtedly. This is a recurring problem for many populist parties who find that their ‘anti-party’ position creates practical problems in structure and organisation, with competing factions existing uneasily within the party.